Four young women entrepreneurs band together to eliminate discrimination against migrants through social innovation. UNDP is their ally in this challenging process. For VenPe, focusing on women has always been an important part of their project. “In the beginning, when we were trying to narrow down our public, we created this imaginary migrant that we wanted to target. Very quickly, we realized that there’s a massive difference between the way things are for women than they are for men,” said Mariel Sifuentes, member of the project. 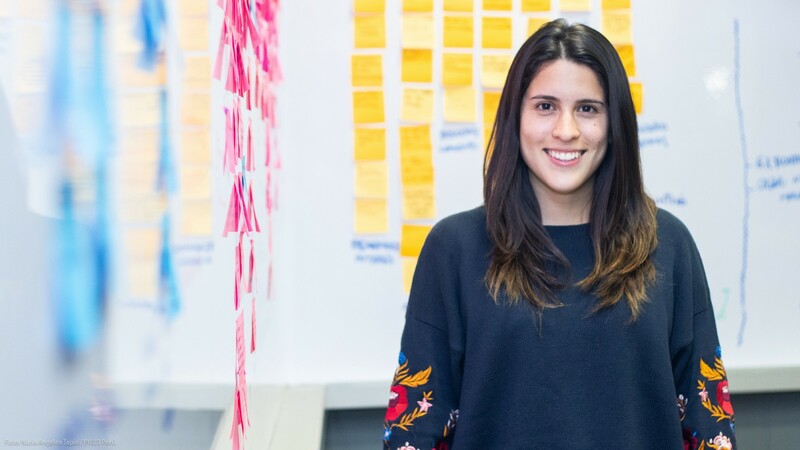 Mariel, together with Rubi Lovaton, Alexandra Vassallo and Grace Solano make up VenPe, an initiative that is trying to solve a complex and pressing matter in Peru: immigrant discrimination. Moreover, VenPe is being designed with women in mind; like they say, challenges women immigrants face are much greater in magnitude and quantity. This project was created last month during the Global Goals Jam, an event that was held in more than 70 countries around the world and was organized in Lima by the United Nations Development Programme (UNDP Perú) and local allies from the public and private sector, like the Ministry of Production, IBM and BBVA. 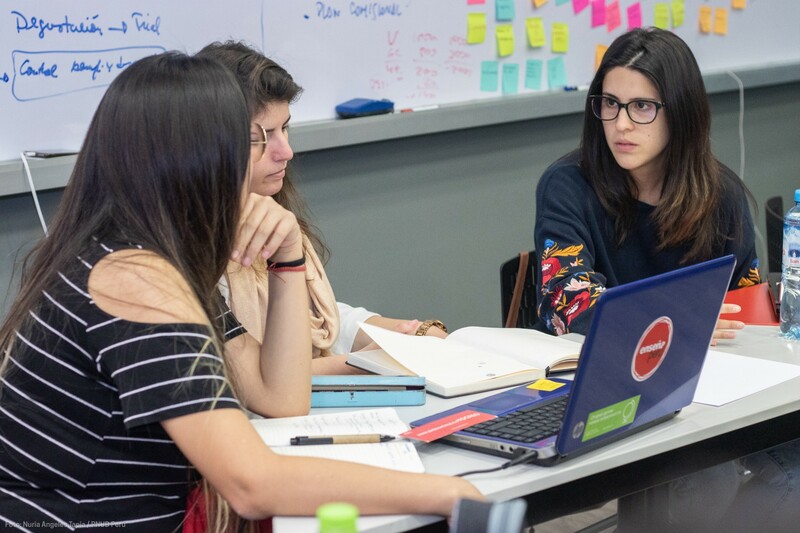 This marathon of ideas had the participation of more than 90 young entrepreneurs in Lima and Piura, two Peruvian cities (for more, check out our previous story, published by the Amsterdam Digital Society School). In this competition, the participants had to work to come with solutions to specific challenges related to each city and the SDG 11: Sustainable Cities and Communities. Out of the four key issues Lima’s participants had to tackle, which included public transportation, street harrasment, and plastic waste, VenPe focused on the fourth one: the discrimination of immigrants in Peru. In the last few years, the state of migration in Peru has wildly changed. A not-so-distant neighbor to the north, Venezuela, has been going through a crisis so severe that it has caused hundreds of thousands of their citizens to flee the country in search for better opportunities. Peru, Colombia and Chile have been some of the countries chosen as a destiny, either temporary or permanent. According to the International Organization for Migration (IOM), as of July more than 460,000 Venezuelans have arrived to Peru since the beginning of 2017. Sadly, despite 40% of the Venezuelan migrants having completed a higher education degree (college or beyond), 85% work but are not on payroll. Finding work is hard, and doing something related to your profession is even harder. This is where VenPe comes into place. 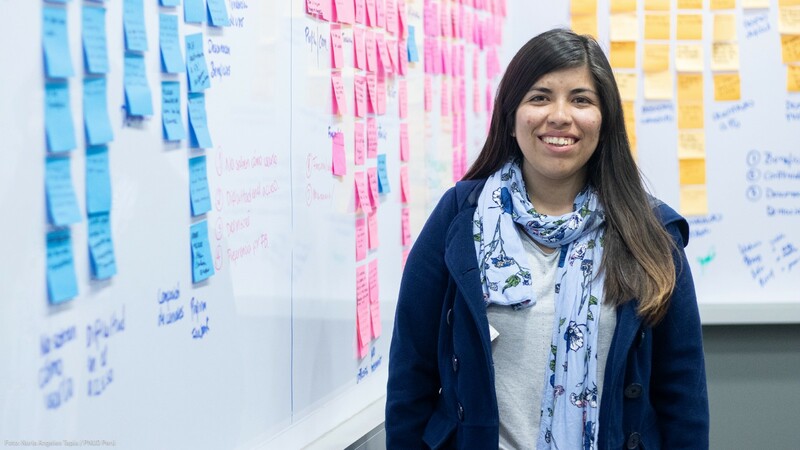 Called by peers and judges during the GGJ the “Tinder for Professionals,” the web-based app would connect migrant women with teenagers and young adults for virtual and face-to-face classes related to topics like engineering, sciences and school in general. “We thought, ‘why not take these people who are already trained in these topics with students that want to learn?,’” Sifuentes added. It is a state of double vulnerability that puts immigrant women at a precarious position: they face challenges for being immigrants in an unknown city, and are in constant danger due to being women. For most of them, tackling this was important; they either have friends or acquaintances who are immigrants and have been through similar situations. For one of them, however, it was a personal challenge too. When she was a teenager, Rubi Lovaton came from the city of Cusco, east of Lima, and says she has personally felt these challenges in the capital. A month after winning the GGJ, they’re ready to start working on their project. 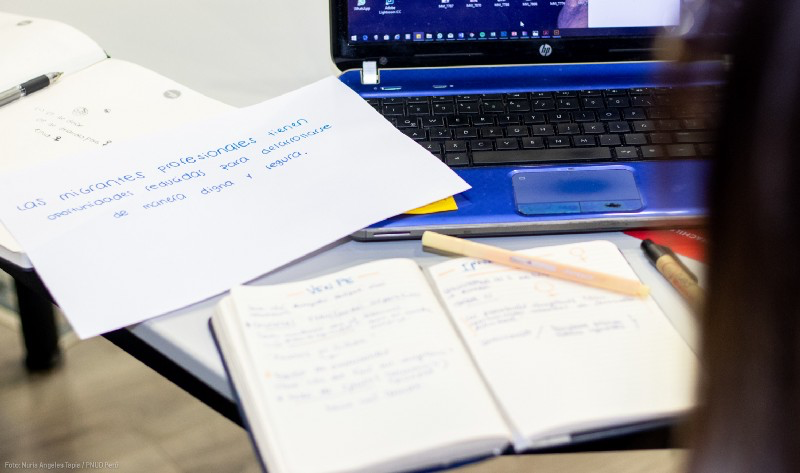 Last week, they started the “idea validation” process under the guidance of StartUPC, one of the organizers of the GGJ Peru. Renzo Reyes, the Business Initiative Chief, made it very clear: while they have ideas and conviction, they still have a long way to go. Another important aspect is the viability of the projects. Like Renzo said during their first meeting, having good ideas is not enough; you have to make sure you’re sustainable if you hope to survive. This process will last for 6 months, in which the different groups being coached will go through intensive brainstorming sessions, mock business pitches and workshops from experts from different companies, like LinkedIn and Facebook. Later, they’ll be coached by UNDP in Sustainable Development and in Agile Methodologies, User Experience and Marketing by IBM. UNDP will advice VenPe in their incubation process so they can tackle the problem from a multidimensional level, and if they develop a prototype, the’ll have the chance to test it alongside our initiatives and projects; a joint effort with gubernmental, local and national allies. Renzo Reyes, Business Initiative Unit Chief, StartUPC. Since we’re focusing [with VenPe] on the social aspect, what we’ll do is develop sustainability mechanisms for their idea” — Renzo Reyes. For the time being, they’re narrowing their public and objective. 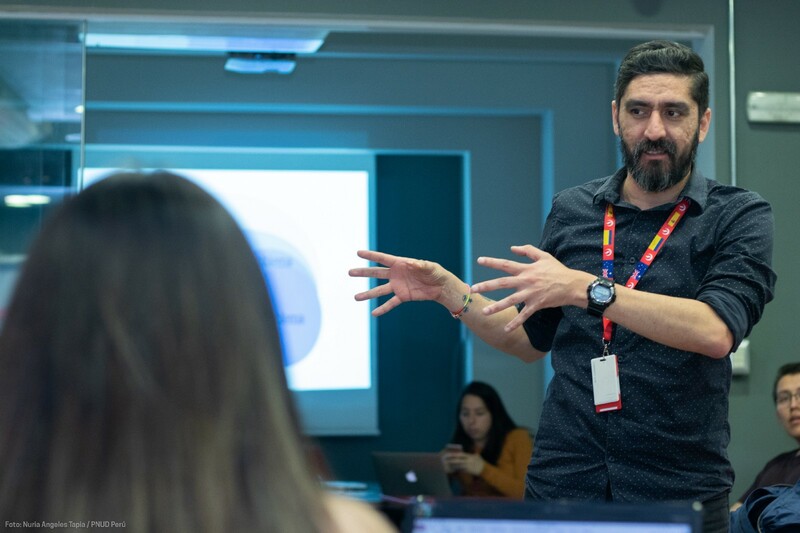 “For now we’re focusing on what our project’s reach is: we have an initial impact, which is what we can offer to our users, and then the direct impact, which is the interpersonal learning that occurs between the students and the instructors,” said Vassallo. For this team, social innovation has to be the focus of the project. “Something that we personally loved for the GGJ was the focus on innovation with a social background. We hope more projects include it and it’s something we hope to develop in the future,” added Solano. The mix between economic sustainability and social innovation is something that guarantees that VenPe can dream with solving such a complex problem while at the same time keeping their feet on the ground. 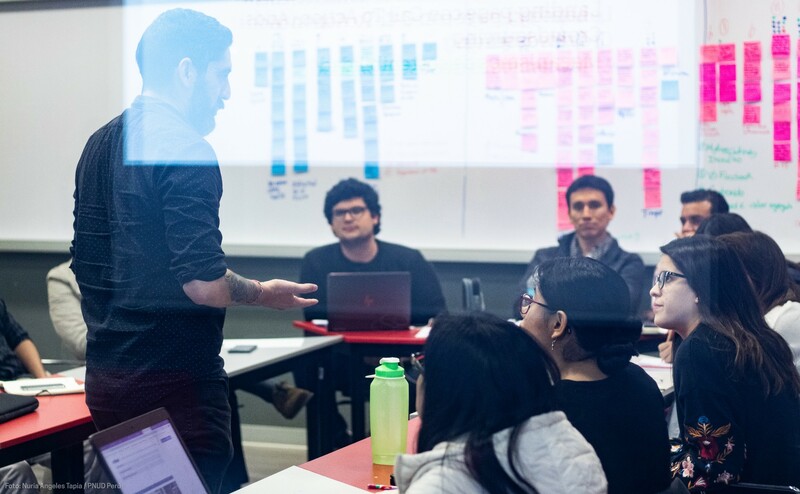 In StartUPC, they’re working with other teams that are not looking for social ideals like they are, but possess business abilities that they hope to learn from. In any case, for the members of VenPe 6 months of hard work await. They’ll have consider every possible angle to give their project the biggest chances of success. Together with UNDP and their allies, they join the efforts of thousands of Peruvians to solve problems that afflict our country’s most vulnerable; this time, from a sustainable business’ point of view that guarantees their economical, social and environmental sustainability, aligned with the purpose of the Sustainable Development Goals. To UNDP Peru, combining youth, social innovation and new technologies, as well as opening the doors to more allies is be the way to improve our efforts to leave no one behind. “It’s important that all of us [women] know that every single of us has the potential to be agents of change, and we want VenPe to be that ideal network of allies,” Vassallo remarked. VenPe during their first idea validation session. They’re working with 6 other teams, including the other winners of the GGJ Peru, team Diana.